As we move away from land the traffic noise diminishes and the only sound is our paddles breaking the waters' surface. The luxuries of Stand Up Paddling is that everything slows down; there is time to look around, to feel nature and count one's blessings. 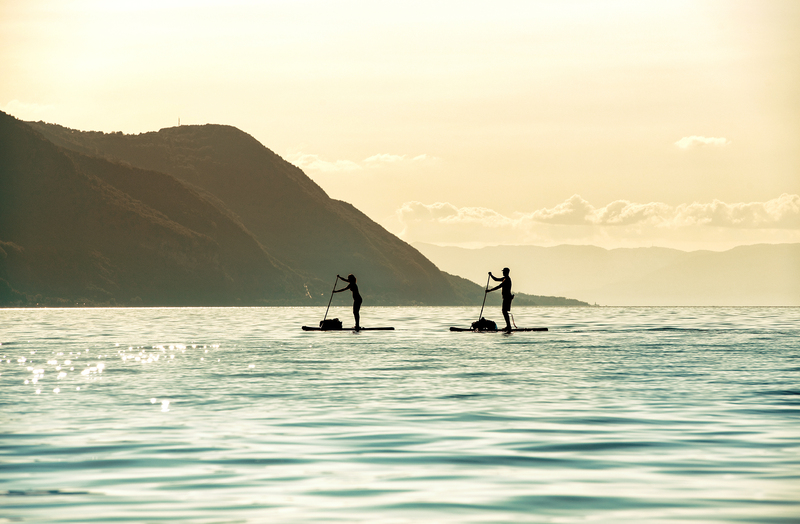 JUSTIN HESSION AND JEAN-LUC GROSSMANN FROM PLANETVISIBLE TAKE ADVANTAGE OF NEW, SMALLER, LIGHTER, AND MORE COMPACT STAND UP PADDLEBOARDS, AS THEY TRAVEL LAKE TO LAKE BY TRAIN TO DISCOVER THE DIVERSE BEAUTY OF SWITZERLAND. It feels like we are paddling through a Swiss fairy tale; the Alps tower overhead and little villages cling to the cliffs as the lake presses in from all sides. However, it is the castle that demands all of our attention. It sits alone on the shore no more than a kilometer away. With each paddle stroke, the distance between us remains, as if the castle lies suspended on a gigantic canvas. One of the luxuries of Stand Up Paddling is that nothing moves fast. Everything slows down; there is time to look around, to feel nature and count one’s blessings. Switzerland is full of incredible and diverse beauty. Our four-day adventure will take us headlong into three distinct regions, each renowned for their scenery though culturally different. 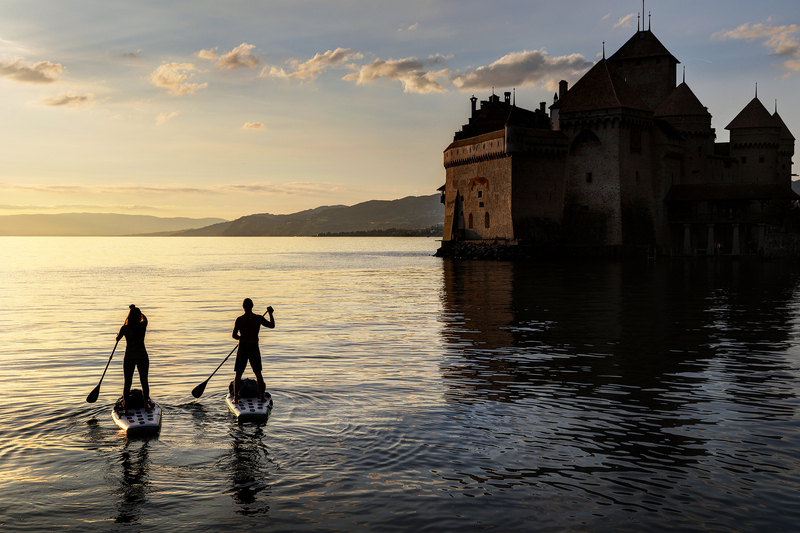 We will tackle three different languages and travel by the Swiss train system, accompanied by a new Stand Up Paddleboard built for adventurers who crave the mobility to discover out-of-the-way places. 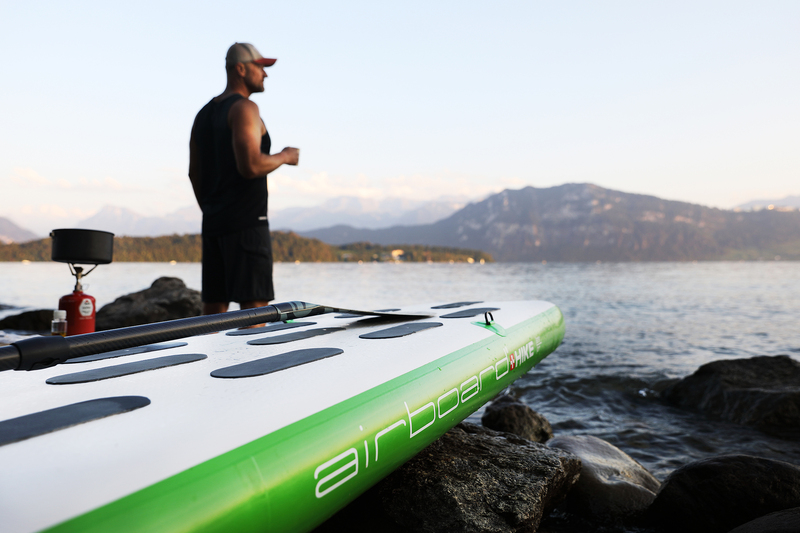 They have been designed by Airboard, a Swiss manufacturer and innovator of inflatable SUPs. At only 5.2 kg, the boards pack into a bag not much bigger than a day pack, giving us the freedom to hike, cycle, and move with the boards into areas that were previously difficult to access. It’s time for us to take advantage. Switzerland is known for its precision, and nothing exemplifies this more than the train system. As we depart Zurich main station bound for Lausanne, the famous Mondaine clock, which for 75 years has kept the time on every platform throughout the country, counts us down to the exact departure time. These clocks are as well-known as melting cheese over potatoes, and we can’t help being impressed as the train departs not a second late. 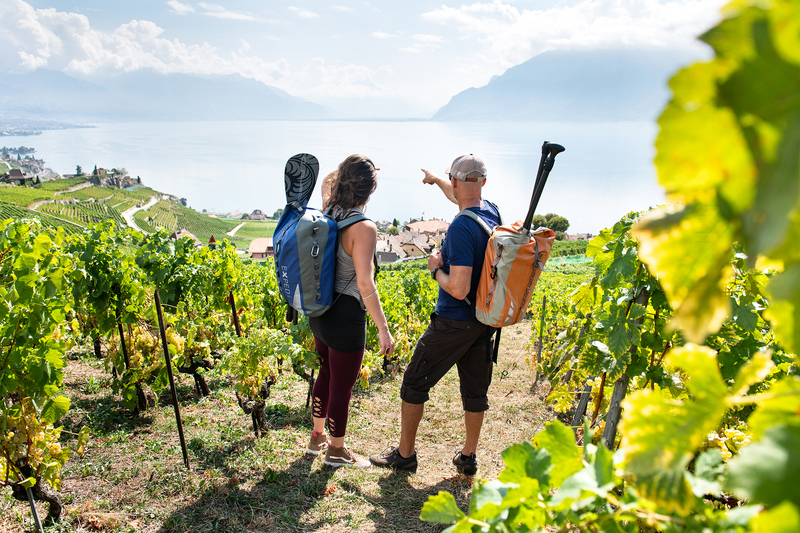 Our first stop is the UNESCO World Heritage Site of Lavaux about two and a half hours away. Terraced vineyards sprawl down from the mountains for 30 kilometers along the shores of Lake Geneva. Stone walls from the Middle Ages separate each small plot as irregular roads crisscross up and down the slopes to create a jigsaw puzzle of greenery. 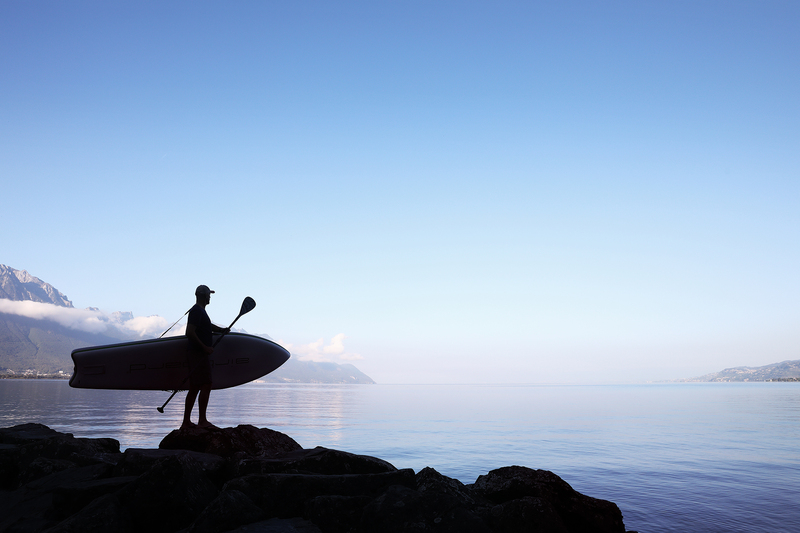 It’s the ideal starting point to stretch the legs before hitting the water. We disembark in the small village of Chexbres, swing the backpacks over our shoulders and head off into the vineyards. It is an easy 30-minute walk down to the lake, easier anyway, then climbing the opposite direction. We pick a path; any path going down will do as we don’t have an exact put-in point, in fact, we don’t really have a strict schedule for the whole trip. That’s the advantage of these new boards, they make travel so flexible and mobile. 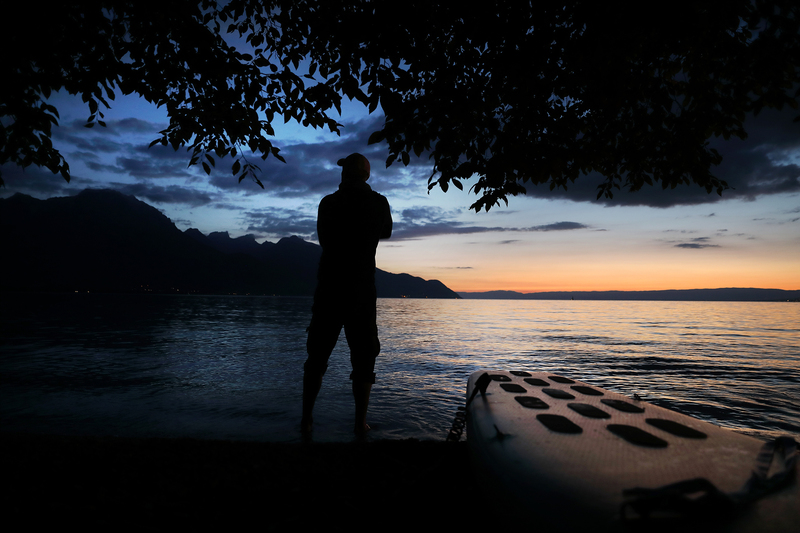 Being on the side of the mountain means we have views right across Lake Geneva, the Swiss Alps and into France. We don’t see any other hikers, only the occasional farmer working the vines. The harvest is almost ripe, and we can’t help picking forbidden fruit fromleman this Garden of Eden. Unlucky for us but fortunately for the farmer, the grapes are not ripe enough to enjoy; another two weeks maybe. As we arrive in the quaint little town of Rivaz, we want to stop and pick up a bottle of Chasselas, the white wine variety from this region, but we are too early for opening hours, so we carry on, hoping for a later opportunity to taste the local produce. We find a beautiful little beach just outside the village and start pumping up the boards. It’s always a little strenuous, but the nervous excitement of finally hitting the water eases the work. We strap our bags to the boards, attach the fins and exchange a quick smile as we push off. 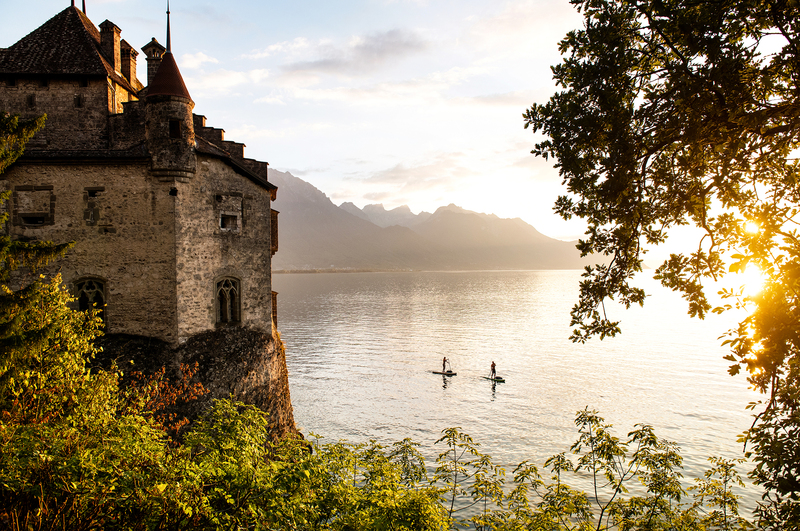 Our goal is Château de Chillon, about 15 kilometers away. If the wind stays calm, it should take about four hours. Being on the water feels great. As we move away from land, the traffic noise diminishes, and the only sound is our paddles breaking the water’s surface. 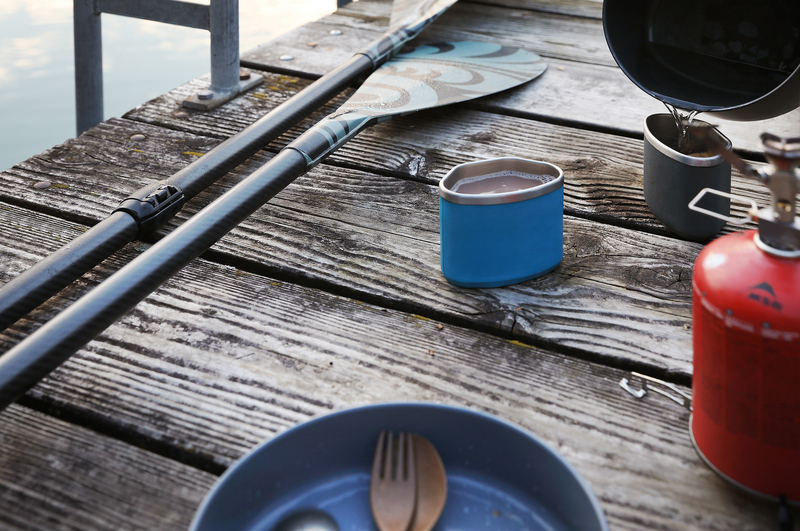 We are used to paddling long distances and soon settle into a nice comfortable rhythm. The boards are shorter than usual, so they don’t move as quickly as the longer boards, but our speed is still reasonable. Lake Geneva (Lac Léman) is 60% Swiss and 40% French and is the largest lake in Switzerland. Looking back down towards Geneva is like looking out to sea. We stop for a simple sandwich and eat them on the boards, sitting with our feet on either side like a surfer waiting for a wave. We take a swim and enjoy the summer sun. European summers in this part of the world are short, so any sun is desperately absorbed. Château de Chillon lies in the distance. There are no boats in our line of sight, and we remark that by concentrating only on the castle we could practically image we were back in the Middle Ages, that is until we get into standing position and laugh at our form of transport. What would King Arthur think? Likely he would have had us hung as witches and warlocks. For the next three hours, we are spellbound by the castle’s elegance and grace. It rises from the lake’s depths as if built on nothing but water. The walls span 30 meters vertically, forming an imposing, impassable fortress against attack from the water. It is a grand architectural achievement that must have impressed the local farmers 800 years ago as much as it impresses us today. We paddle around its perimeter and then back again and then around once more under the setting sun. We camp further up the lake, the castle’s silhouette still in sight. As it grows darker, I recite stories of old about the chilling torture chambers and the harrowing battles that took place right where we are. This inspired bit of spontaneous Google research makes me seem like a tour guide for some haunted underground city walk. We climb into our sleeping bags, lay on our boards and stare up at the stars filled with thoughts from another time. Around five am the first birds begin their songs, and a thin strip of color starts to highlight the horizon. Camping wild never affords sleep-ins, so it’s in for a swim before breakfast and then back on the boards heading for Montreux. It is magically still at this hour with no boats to disturb the water. Our reflections give the illusion there is no separation between the sky and land, which gives the feeling we are flying rather than paddling. Montreux is a beautiful town at the eastern end of the lake. 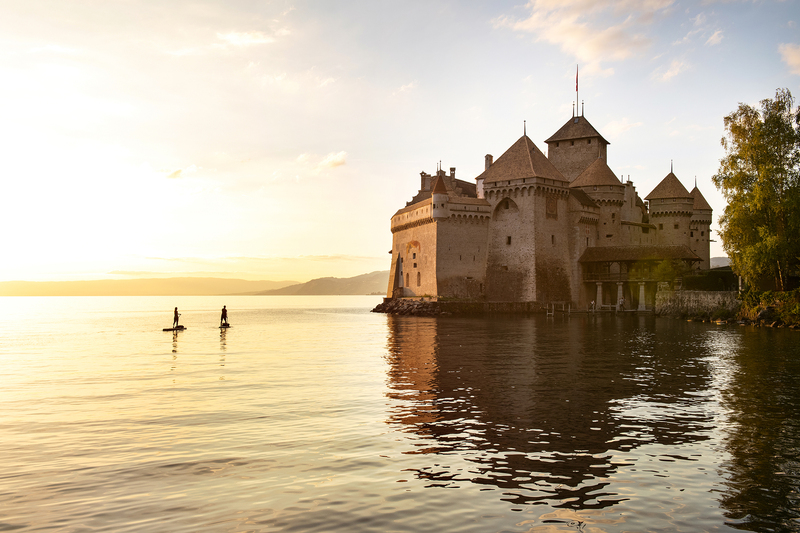 Called the capital of the Vaud Riviera, its mild climate has attracted the rich and famous from Charlie Chaplin to Freddie Mercury. It was where Deep Purple wrote “Smoke on the Water” after witnessing the Montreux casino go up in flames. The town has a long attachment to the music industry and is home to the world-famous Montreux Jazz Festival, but we are about a month too late for some music. There is only time for a quick stopover before catching the train into the German-speaking territories. The SBB (Schweizerische Bundesbahnen) train system has no peer when it comes to efficiency and reaches, and gives a myriad of choices in getting to Luzern. We need to change trains in Lausanne and then organize the next part of our trip. Our destination is the Lake Vierwaldstättersee (Lake of the Four Forest Settlements). 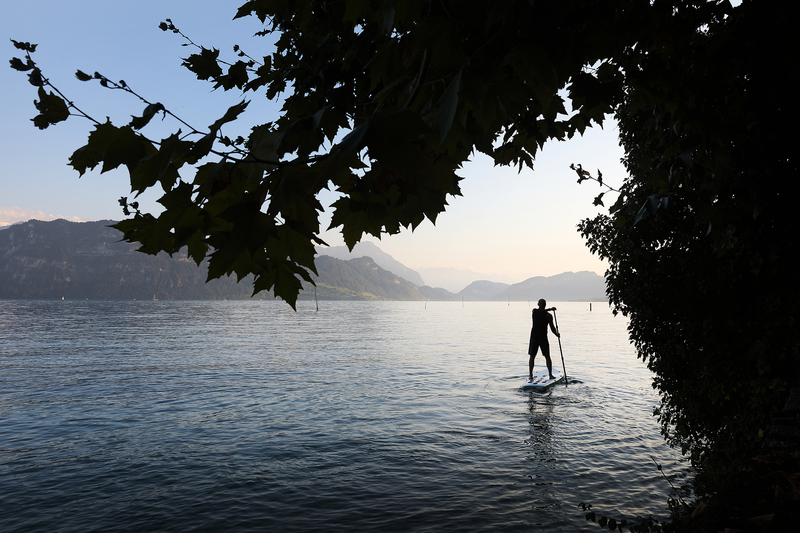 The idea is to put in somewhere in Luzern and paddle in the shadow of Mount Pilatus. I have loved this area since first moving to Switzerland. To me, it’s the most idyllic scenery in a country full of idyllic landscapes. The rolling hills are so green and perfect that they could be mistaken for the fairways of a golf course. A lonely path winds back towards the lake, past a little farmhouse dropped by the snow-capped Alps. This area is full of typical Wolfian landscapes, although the great 18th-century painter never put brush to canvas in these parts, maybe to guard its secrets. A couple of hours on the train gives us time to dry our wet clothes and eat a hearty lunch. The passing conductor comments that we look like “Crocodile Dundee” with all our clothes hanging everywhere. Arriving in Luzern, we find a nice little stone beach to put in and then paddle past the amazing KKL building (Kultur- und Kongresszentrum Luzern) with its seemingly floating roof reflecting the lake onto land. 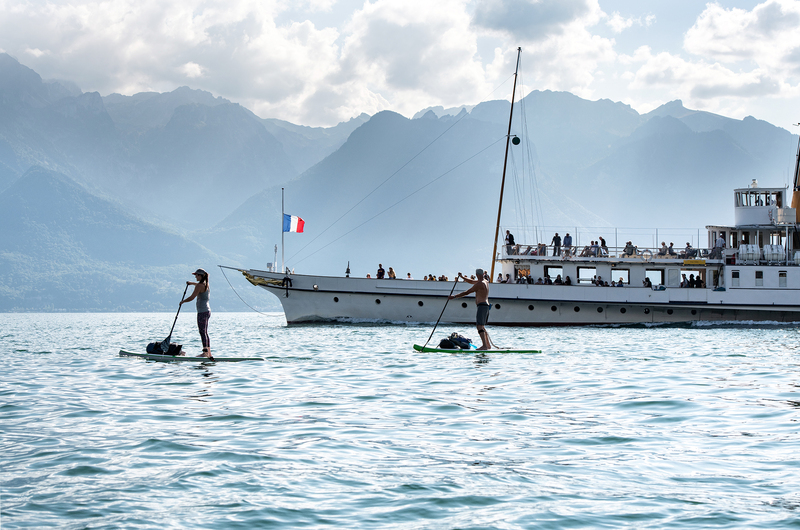 Vierwaldstättersee is busier than Lake Geneva, with old paddle steamers and a few modern ferries plying the water between the yachts and wakeboarders. The lake has a complicated shape, with several bends and four arms heading off in all directions. From an aerial view, it doesn’t geographically look like much of anything. We decide to explore the first arm to the north because it is the closest, and we don’t think it can get any prettier. 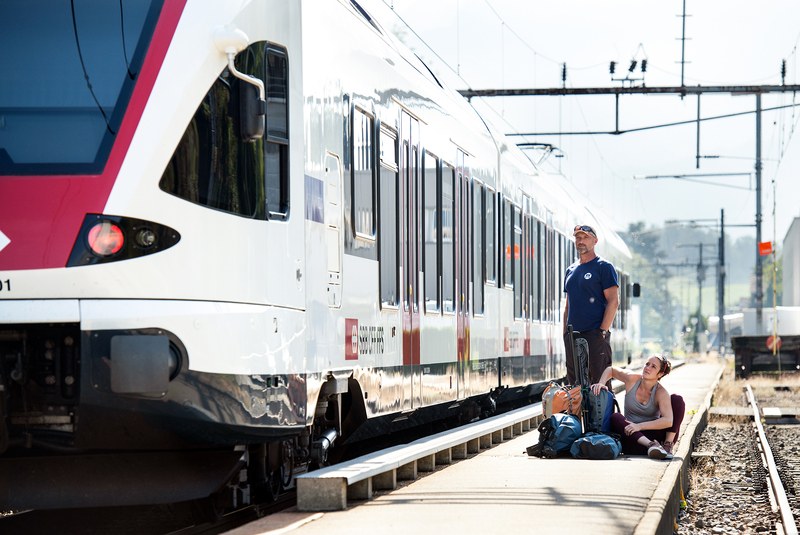 It also has a good train connection for the morning trip to Ticino, and if we can find a spot to Bivouac overnight, it will make for an easy getaway. The water temperature is about 21C (70F), ideal for spending the afternoon flopped on a beach or board. 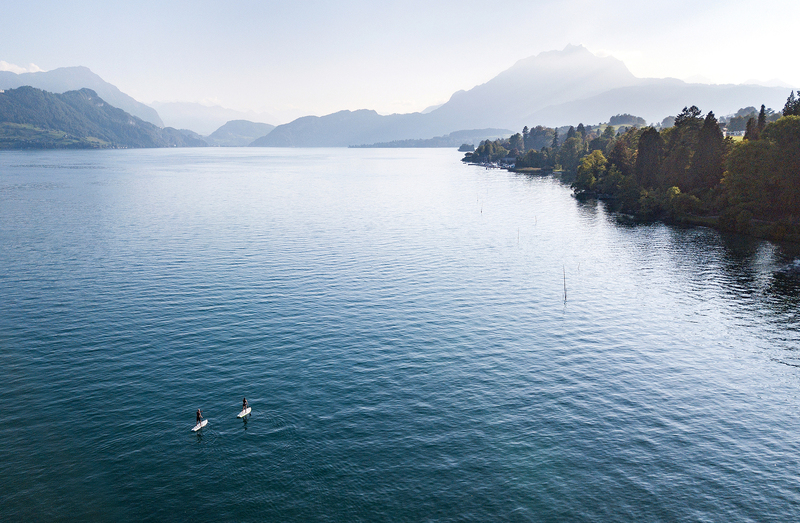 The northern part of the lake lies close to Luzern and Zurich, and 19th-century manor houses sprawl into the lake. The only sign of activity is the little robot lawn mowers as they dodge the Rhododendrons. It is quieter in this part of the lake, so we pull up, unload our gear and sit appreciating Mount Pilatus. As the evening approaches, the contours and scars shaping Pilatus dissolve into the blackness of its silhouette. Standing like the centerpiece of a Tolkien landscape, the mountain’s history is full of tales and mystery. Tonight’s bedtime stories contain tales of dragons with healing powers who supposedly lived within its crevasses and one story related a tale of Petermann Etterlin, who thrust a thorny wrapped spear into the jaws of a dragon and then finished him off with his sword. Unfortunately for the valiant Peter a drop of poisonous dragon blood landed on his hand and froze his own blood, killing him instantly. The next morning the time has come to leave the German-speaking part of Switzerland and head for the Italian warmth. The nearest train station is Meggen, the 30-minute hike through the fields into the forest and down the winding road past the farmhouses is a good wake-up. From here, it’s only two hours to Lugano thanks to the newly opened Gotthard train tunnel. At 57-kilometers in length, it’s the world’s longest and deepest tunnel. The Swiss love their tunnels and seem to be forever burrowing, and they are especially proud of the Gotthard’s engineering excellence. No sooner had it opened in 2016 that they then voted to build another one immediately next to it. Thirty-five minutes in the dark, and we are seemingly catapulted into another world. The sun blazes down, the houses feature Italian architecture, families sit under grapevine-draped patios, and church bells from every village ring in the Sunday morning. In Lugano, we grab some supplies for the night ahead and catch the bus down to the Parco Ciasi. It is the perfect put-in with its little beaches, manicured gardens and the gently lapping water overlooked by the famous Monte San Salvatore. It’s Sunday, and the park is lined with locals out for a stroll with their pocket-sized pooches. It is a picturesque depiction of the Italian way of life, la “dolce far niente,” the sweetness of doing nothing. Lugano is situated on Lago di Lugano in the Kanton Ticino, which is the only Italian speaking Kanton. It’s also part of the Italian lakes district together with Lago di Como, Lago Maggiore, Lago di Garza, and Lago d’Iseo. The lake is mostly situated in Switzerland though nearly a third lies across the border in Italy. 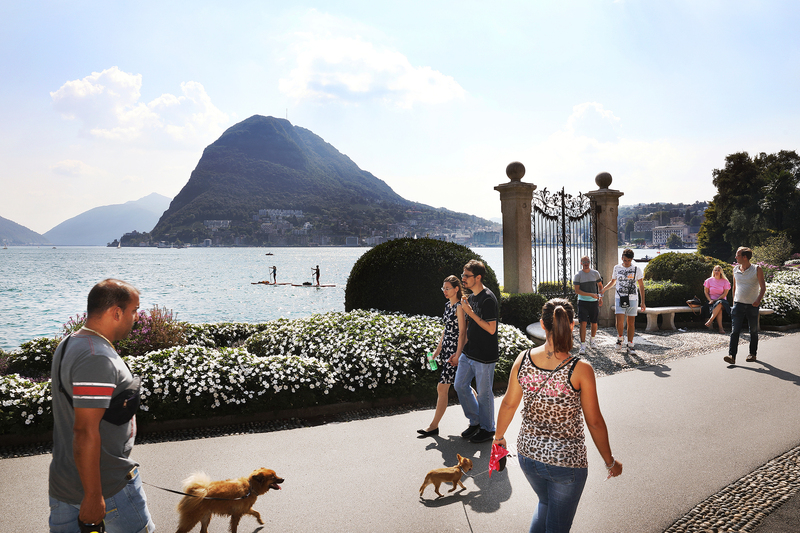 The Italian influence is everywhere, part of what makes Lugano especially appealing to the holiday crowds. The weather also helps; it is noticeably warmer here, the water temperature a balmy 24 degrees Celsius (76 F). We head off in a southerly direction with the intention of spending two days hugging the shores until we tire, then jumping a bus back to Lugano and continuing on to Zurich by train. It is nice not to have exact plans. 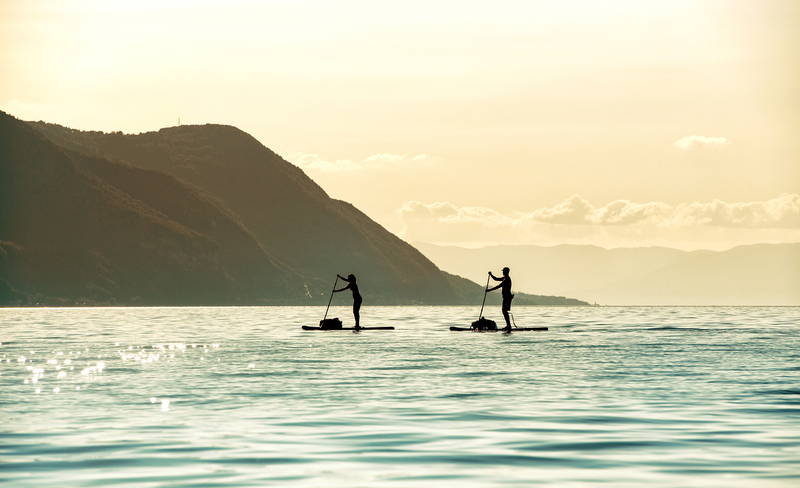 We paddle when we feel the need, swim when the sun bakes our skin and search out a small beach to spend the night once the sun begins to dip and the crowds wander off for dinner. We were told that the jewel of the villages along the shore is a place called Morcote. It is enough temptation to head in that direction. We pass a host of amazing villas dotting the coast that has us dreaming of spending endless summers under the southern sun. Though our accommodation for the night on a small public pier isn’t as grand as the surrounding villas, with the SUP boards as our mattresses and the stars as our blankets, it is all we need to settle back, cook dinner and enjoy a bottle of vino. We have become accustomed to early morning swims under the rising sun and this morning is no exception. After, it is only a short paddle to Morcote where espresso beckons. From our watery vantage point, Morcote doesn’t seem like much. It isn’t until paddling further away from shore that the village’s full beauty pieces together. Dominating the hillside is the church of Chiesa Santa Maria del Sasso. It sits majestically overlooking the village as the apartments below create an almost fortress-like barrier at the water’s edge. The morning is warm and sunny, and the water is the calmest we have seen, without a breath of wind. A few restaurants built on stilts sit as if floating on the mirror-calm surface, their flower boxes overflowing with red geraniums. Across the street under the shade of the pines are covered archways lined with tables awaiting the lunchtime crowd, perfect for breakfast. Returning to the water, we give ourselves some distance from the shore to take one last look at this iconic Italian lake village. 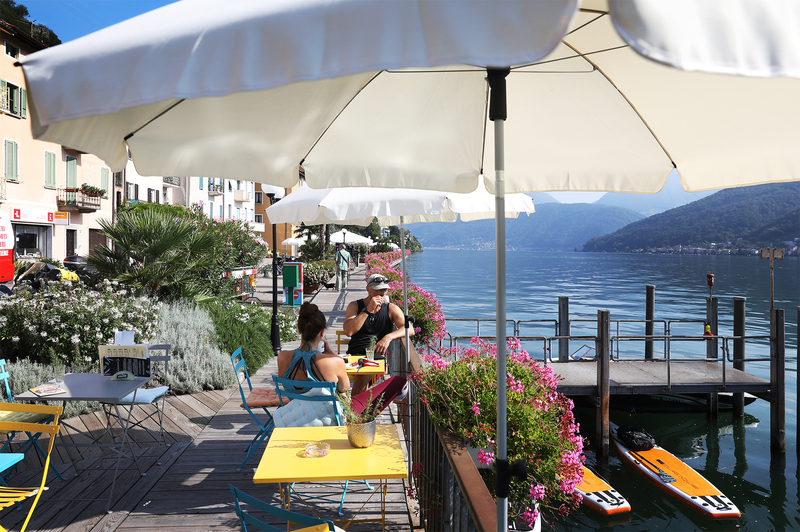 The plan is to paddle around the Morcote peninsula, heading North to Ponte Tresa on the Swiss/Italian border about ten kilometers away, where we will pack up the boards and return to our normal life. Despite the trip’s impending end, it is our most relaxing day, a day of dolce far niente. A quick stop for ice cream and some wild apples growing from branches overhanging the shore and lunch is done. 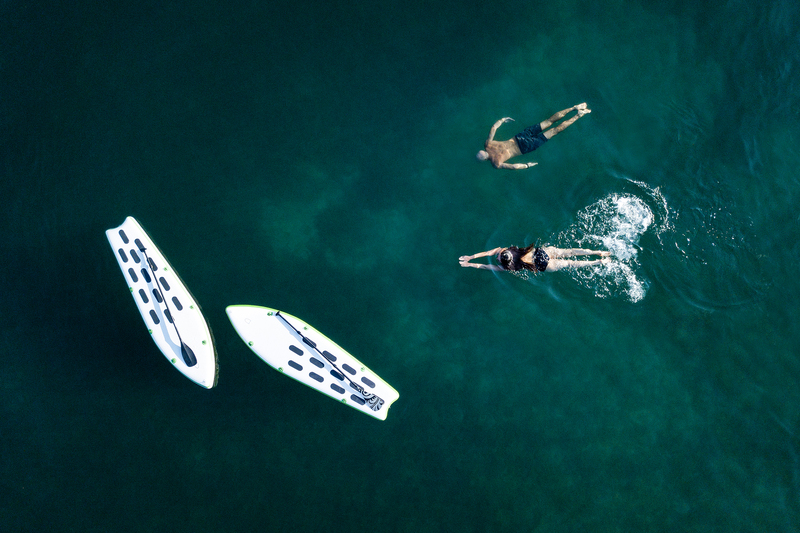 We drift aimlessly on the boards between swims. Lying under the summer sun, we think about the last few days and how we have seemingly experienced three different countries without ever crossing a border. Maybe the beauty of Switzerland doesn’t lie only in its landscapes.